Our Pullover sleepsuits are an ideal first outfit; these simple and ultra comfortable Sleepsuits are perfect any time of the year. Made in the UK from 100% fine combed cotton these sleepsuits are soft against delicate skin and are prefect for printing or embroidering on. 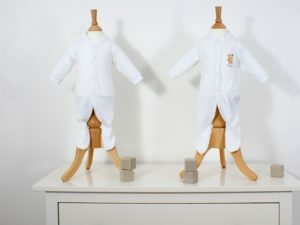 Be the first to review “White Plain Front Sleepsuits” Click here to cancel reply.